As I write, my “babies” (daughter Jamie, with her niece Alexia and nephew Julian) are sitting on a plane flying out of D.C. that will bring them home tonight. I am overjoyed and excited and can hardly sit still with the waiting. In another nine hours they will most probably be home and tucked in bed, and tomorrow we will begin two months of summer bliss with the kids. In the meantime, I’m cleaning a few things out on my computer and getting a few things out of the way. I hope to be able to enjoy a lot of free time with the kids! I found this picture I hadn’t posted yet of my friend Bachita’s progress with her owl quilt. She does blanket stitch appliqué (by hand) and her work is incredibly meticulous and dainty. She has assembled each owl first and is now ready to appliqué them to the background fabric. Aren’t they just fabulous? 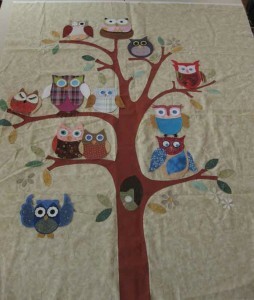 I love this owl quilt. Could you tell me how to get a hold of the pattern? This was one of our member BOMs for 2011, and is no longer available. We do hope to open an online shop soon, and will be offering this pattern again there. Is this pattern available anywhere? My friend is doing her nursery in owls and I would love to make this for her.